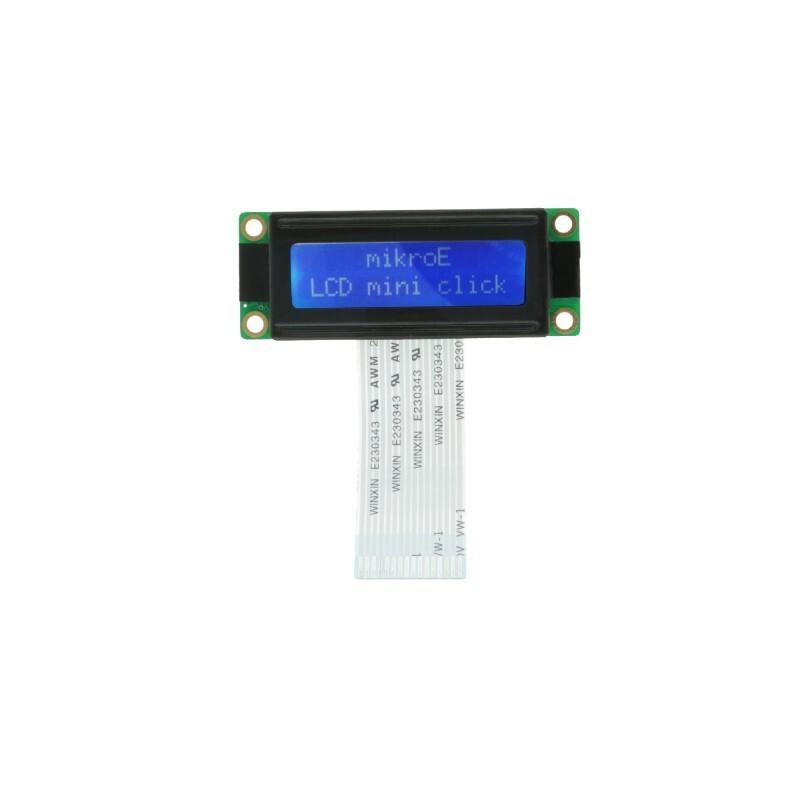 LCD mini click displays 2x16 monochrome characters on an LMB162XFW LCD display. 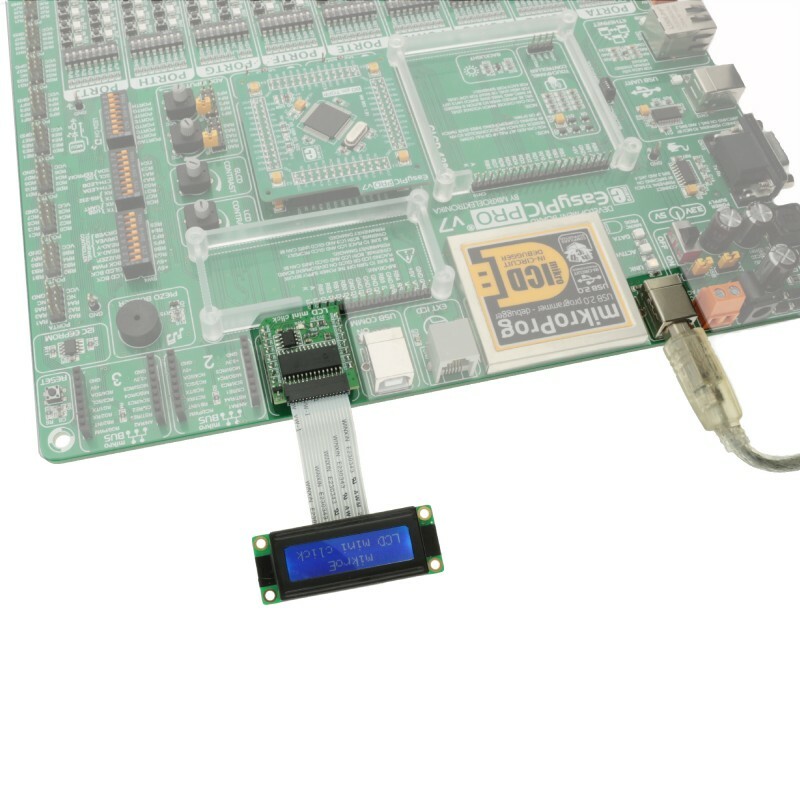 It features the MCP23S17 port expander and the MCP4161 digital potentiometer, both from Microchip. 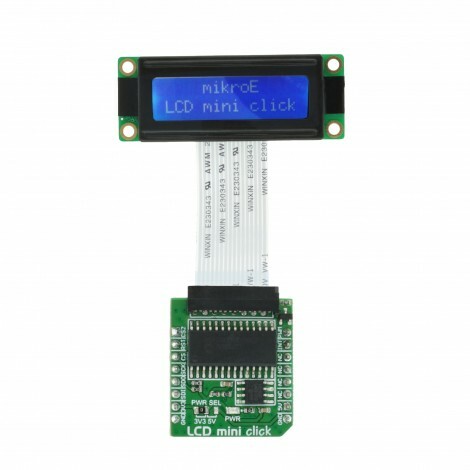 LCD mini click is designed to communicate with both 3.3V or 5V capable MCUs. It communicates with the target microcontroller over the SPI interface and the following pins on the mikroBUS™ line: PWM, INT, RST, AN. 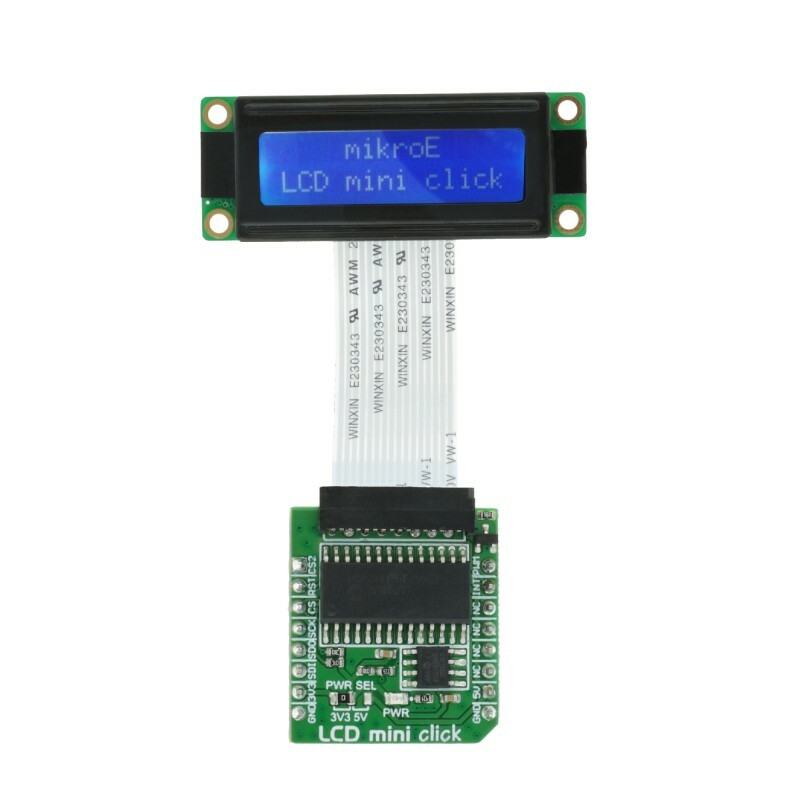 LCD mini click displays 2x16 monochrome characters on an LMB162XFW LCD display. 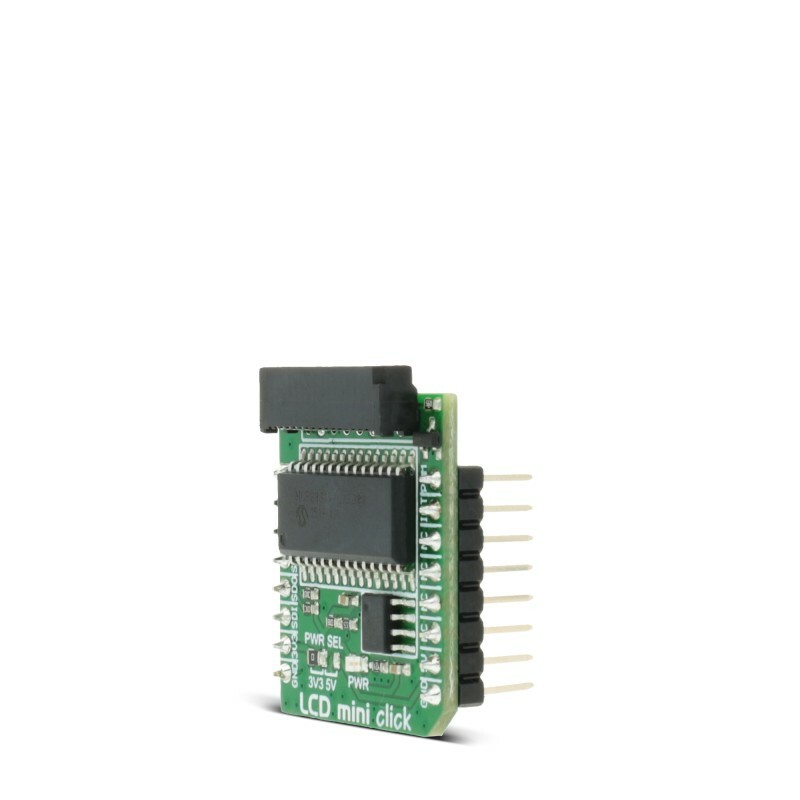 It features the MCP23S17 port expander and the MCP4161 digital potentiometer, both from Microchip. 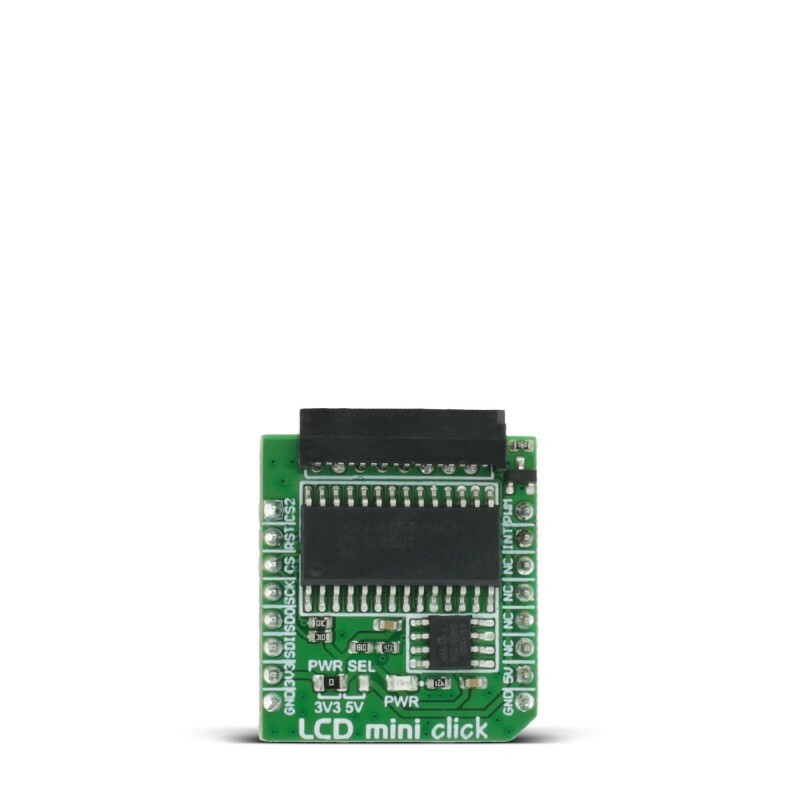 LCD mini click is designed to communicate with both 3.3V or 5V capable MCUs. The logic voltage level selection is done by the PWR SEL onboard SMD jumper. 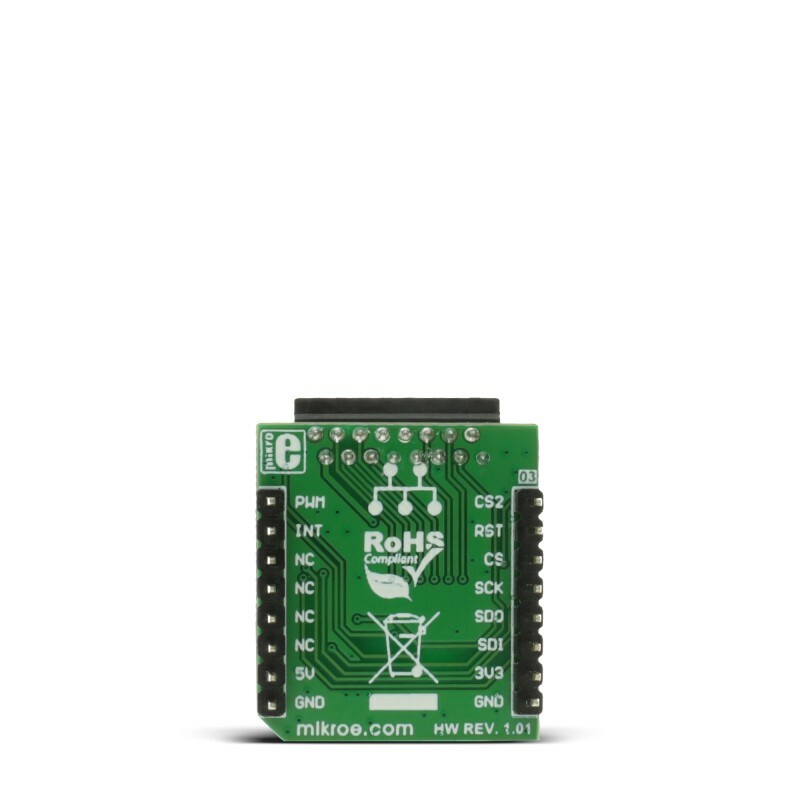 The 5V rail from the mikroBUS™ is used directly for powering up the included LCD screen. The click board™ communicates with the target microcontroller over the SPI interface and the following pins on the mikroBUS™ line: PWM, INT, RST, AN. The PWM pin onboard the LCD mini click is used for backlight control. While the digital potentiometer is used for contrast adjustments. 2x16 LDC displays are ideal for displaying short messages and numbers. They can display 16 characters per one line, 32 in total. The 5x8 dot font displays characters, symbols, and numbers clearly and vividly. Key Benefits Onboard port expander for LCD control, digital potentiometer for contrast settings, PWM for backlight control. This table shows how the pinout on LCD mini click corresponds to the pinout on the mikroBUS™ socket (the latter shown in the two middle columns). The demo shows how to use the SPI LCD library to communicate with the LCD (with HD44780 compliant controllers) in 4-bit mode via the SPI interface. It also uses the PWM for the backlight and the on board digital potentiometer, for controlling display contrast, which can be accessed through SPI. The demo iterates through all the values for the backlight and the contrast intensity. The main function of the demo.